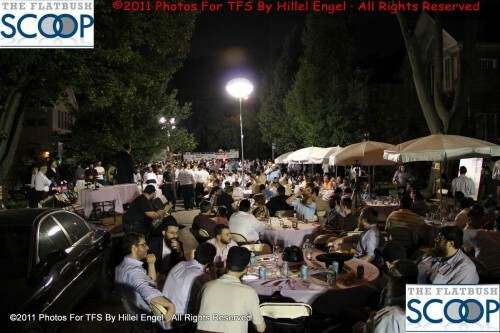 Despite a sudden downpour that temporarily extinguished the barbeque grills, over a thousand attendees enjoyed the exciting and tasteful RCCS (Rofeh Cholim Cancer Society) Flatbush/Crown Heights barbecue, to benefit the scores of cancer-stricken patients in the Flatbush and Crown Heights communities. In response to the ever-growing numbers of RCCS cancer patients seeking insurance help, two neighboring communities, Crown Heights and Marine Park, joined the effort to make this year’s attendance the largest in its nine-year history. Shea Rubinstein chaired the evening, while also singing lead to the Hamizamrim choral group, led by Chilu Posen; Beri Weber also inspired the crowd, with his voice. The Guest Speaker, Rabbi Avraham Zucker, delivered an inspiring address, invoking a story about Rav Chaim Soleveichik zt’l, and how it related to the pikuach nefesh work of RCCS. An emotional speech was delivered by Alan Proctor, who related how RCCS helped his family throughout the two year battle of his wife’s terminal illness. The annual Flatbush RCCS BBQ has gained the reputation as being the largest and, arguably, most vital barbecue on the community calendar. Delicious entrees, mouth-watering accoutrements, and exciting raffle prizes and entertainment combined for an evening of chessed and inspiration. Wine tasting, a sushi bar, and other delectable delights added to the festivities. The evening was dedicated to the memories of Tzipora Faiga Gelb, a”h and Chedva Friedel Rand a”h . Each year, RCCS saves the lives of hundreds of cancer-stricken patients in need by subsidizing their health insurance premiums, thus providing them access to the best possible medical care. Today, RCCS subsidizes insurance policies for hundreds of cancer-stricken patients annually, and provides their families with insurance advocacy, social services, and medical direction. If you could not make it to the event but would like to donate, please click on the following link https://www.rofehcholim.org/donate.php or call 718-722-2002.